It goes without saying that avocado's popular -- especially smeared on toast. But what if I told you you could ditch the carbs in toast and skip straight to the avocado as the toast? Is that something you might be interested in? No? OK. That's cool. But apparently, it's the latest food trend sweeping across Instagram, and there are photos to prove it. Created by Amsterdam-based food stylist Colette Dike, the starch-replacement fruit made their first appearance on Instagram back in June. 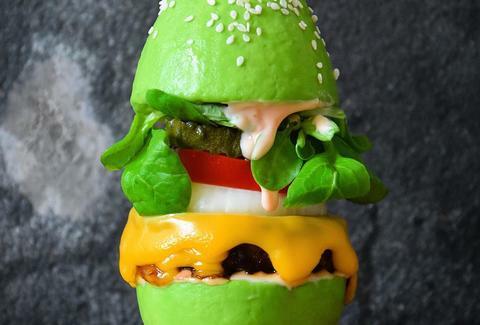 But it wasn't until a newer post that the food invention started popping off, with Mashable calling avocado buns "summer's most polarizing fad. Ehhh. Let's be honest. They're not that polarizing. They're like puppies: cute to look at, but not exactly functional. As Emine Sayer wrote in The Guardian, "The first problem is that cutting an avocado in half crossways just feels wrong. It’s also surprisingly hard to get the stone out. And then what do you do with the hollows?" All valid points. But that hasn't stopped others from trying the mushy buns out. Dike even made another variation herself. Now, while avocado buns likely aren't going to replace buns for the gluten-free folks out there, or even just the bread-averse, they have certainly accomplished two things: giving us all more pretty IG photos of aspirational foods, and getting Colette Dike Internetfamous. Pretty good, just for making a messy sandwich. Ryan Craggs is Thrillist's Senior News Editor. His favorite buns are "Hot cross buns" played on a recorder. Follow him @ryanrcraggs.